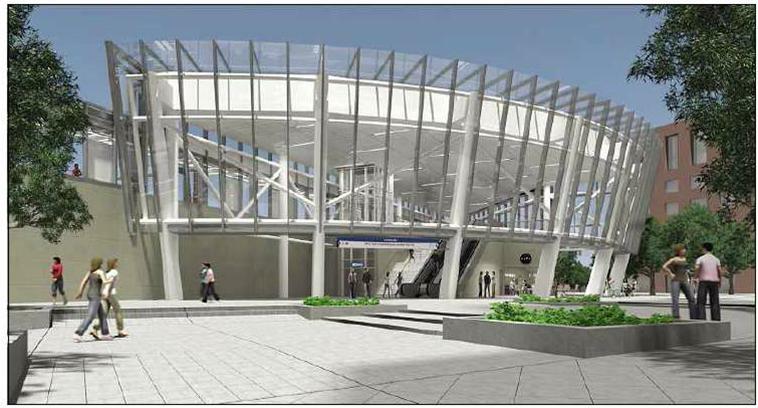 A rendering of the $256 million glass-and-steel Harrison PATH station. Direct access to Manhattan, Jersey City and Hoboken by PATH train has been a cornerstone of Harrison’s plan to transform itself from an industrial center into a commuter hub. Hundreds of condominiums and rental units are already built, under construction or planned for the area surrounding the local PATH station. A multi-phase residential and commercial project now being developed adjacent to the Harrison station is called, aptly enough, Harrison Station. The problem, though, has been the station itself. Built in 1936, it is cramped and in desperate need of upgrades. Anyone riding an NJ Transit or Amtrak train through Newark passes the aging platforms against a backdrop of empty lots and abandoned factory buildings. So developers and town officials cheered yesterday’s announcement that the Port Authority of New York and New Jersey will spend more than a quarter-billion dollars to replace the 76-year-old station with a far grander, more accessible terminal of glass and steel to serve the 7,000 commuters who use the facility each weekday.